He is a weird mixture between Professor and peasant, half refined, half natural whose calm voice can explode in a laughter, great communicator and a sad man dressed with a jacket, corduroy trousers and boots, not keen on watching TV or having debates, nowadays he would be something like a guerrilla member a resistance. He is, no doubt, a fellow from other time. […] He is, in a way, an outsider, a sniper who has one foot in his class while he kicks it with the other. Some would have loved that he kicked that class with both feet. Linked to the Upper-middle class of Valladolid because of his family ties, Commerce Professor, journalist, director and counselor of El Norte de Castilla, father of seven, faithful until his death to his wife, their “rupture” is not theatrical nor definitive. He is a hunter of minor scale. His safaris last only for one day. At night he likes having his feet wrapped up in his sleepers and read with the warmth of a nice fire in his home of Paseo Zorrilla. He loves routine. He always stays at the same hotel when he travels to another city and if possible he asks to sleep in the same bed each time. He claims that being faithful in him has no great value. But he says all this with some distress by some means. Firmly settled in his city, his family, his friends, in the newspaper he is an intimately displaced. The world that he graps is in a horizontal sense, the province towns and that exotic world that starts where interstate roads end. In a vertical sense he has the upper-middle class and the peasant class. He describes the daily drama of the province towns and the archeological of the rural means. Delibes is a man from its region Castilla and he is proud of it. He moves swaping Sedano and Valladolid. Sedano is a beautiful village in Burgos that has enchanted him. There, in Sedano, Delibes built a retreat for himself in 1959, and there he spends really good times. He keeps on having his house and formal residence in Valladolid and up and then he visits the headquarters of El Norte de Castilla (the newspaper where he spent most of his working days. But it is in Sedano where he actually likes living and where this tall, bony, a wide forehead, straight nose, eager eyes (although short-sighted) and a fairly agile body man writes and truly enjoys. It is in Sedano where he happily wakes up to go hare hunting, where he bursts out in happiness after getting his reward when trout fishing, where he goes for long and calm walks under the trees along the river side, where he oves watching the dog run and dribble, where he contemplates the nests and keeps an eye on the wood pidgeons…Where he deeply enjoys chatting with his children (he has seven kids from his marriage to Ángeles de castro, of whom he is now a widower) and playing with his grandchildren ( he has six and they frequently visit him). Sedano is for him the ideal place to keep on falling in love with nature. It is there where Delibes feels more himself. Miguel Delibes with his dog Grin in Sedano, 80’s. It feels like Delibes likes to maintain this image of a sad and rather pessimistic man. Nevertheless, in the same way that his novels are determined by drama or tragedy a ray of irony sticks out in the human relationships that Delibes portraits with a touch of jolliness and good sense of humor. He is a man that gives off human values, a person of great friendliness and enjoyable conversation. He always has the most sensible answer among the all possible. A peaceful man who rarely hesitates when it comes to give his opinion about any matter. He handwrites his novels and works with the same calmly wisdom with which he speaks. Everything takes its time. Any type of work to be well done needs a certain balance. Delibes´wokrs have it, they are fortunately, sensible pieces of work as his author is. Miguel is a passionate Castillian man who loved birds and the weekends, but once the hunting season was on, he would shoot them to death. His beret, boots, a bicycle across the Campo Grande, a cigarette and a worn out jacket which, gave him the distinction of “most elegant man in Europe” (title shared with André Malraux), a broad wide smile and certain melancholy (the touch of class of the pessimistic). At the age of ten, the psychology teacher of his school in Valladolid La Salle, said about him: “he has a rather sad and gloomy look, nevertheless, Miguel is the most cheerful and jolly boy of his group”. Miguel, sad and cheerful. He sang: “I was dancing with Lola yesterday afternoon”, meanwhile he chased the red partridge. He says he is a hunter that can write, not a writer that hunts .He hates aeroplanes, elevators and he seeks the open air of that Castilla which Unamuno named “dermoesquelética”. If Castilla didn´t exist, this man, (descendant of the French composer Leo Delibes lonely and sensitive) could have been happy in the Far West without shooting a single buffalo or Sioux but peharps one or two wild ducks, since he was a merciful hunter. Miguel is merciful and generous, a bit tormented perhaps but very keen on justice and fairness and contrary to faking or exagerations. Sincehis wife died he needs to take sleeping pills to beable to sleep, but another issue worries him too: the world is not the way he would like it to be. 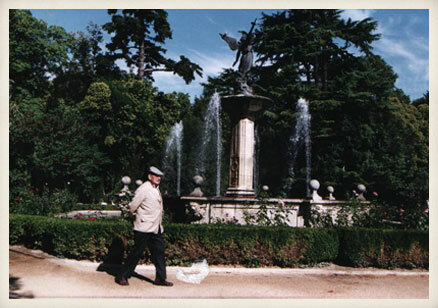 The writer walking through the Campo Grande Park, Valladolid, 2004. Manuel Leguineche: “Fuego y humo”, El Urogallo, 73 (June 1992), p. 51. I was always impressed by Delibes´ coherence. He is one of the fewest men that says what he means and thinks before speaking and he acts according to what he means and says. Antonio Giménez-Rico, en Antonio Corral Castanedo: Retrato de Miguel Delibes. Barcelona, Círculo de Lectores, 1995, p. 97. Nowadays a writer who believes in God is an exception and without a doubt Delibes is a Christian. His faith in God is expressed in his respectful attitude torwards all living creaturesand his strong human values and this is plain to see in his literary style which allows the characters to have their intellectual and linguistic independence. Even Delibes´ life is an example of stability and at the same time of very deep beliefs in the humanbeings, these two allow him to live within the Spanish society without losing his dignity as a commited man. The life of Delibes is for us a clear example of how an authentic man can live in a historically difficult period of time. 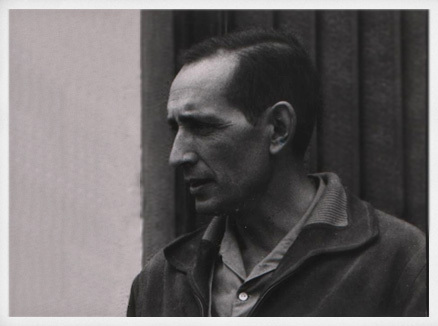 Edgar Pauk: Miguel Delibes: desarrollo de un escritor (1947-1974). Madrid, Gredos, 1975, p. 20. In the true astonishment of Miguel Delibes about the success of his books, his total absence of vanity, is where I find the key of the success of the writer. All of him, pure, real, attached to his homeland, touched by the true humanism… I hope that Miguel Delibes still writes many more books. Wonderful, melancholic books about the people and the region of Castilla; condemming books; books about the love to the sad human nature; books about children, partridges and hares; about the naïve irony of some heart in love. And the reader will claim once again: “this is the best book of Miguel Delibes”. What the reader always said so far. Is such the writer´s strenghth that was gifted with the genious touch. 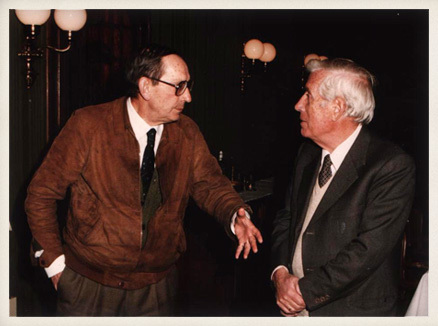 Miguel Delibes y Josep Vergés, 1985. Josep Vergés, editor de Miguel Delibes, in Antonio Corral Castanedo: Portrait of Miguel Delibes. Barcelona, Círculo de Lectores, 1995, p. 95. His name and his work allow to get to know ourselves better, they go through us and illuminate us, without them we would be perhaps poorer, lifeless, less open minded and less human beings. Thus out deep gratitude for his simple accuracy, for being a gentleman and his inner elegance, being so discreet and his amazing dignity that makes the rest of us a little more deserving. Rafael Conte: “Miguel Delibes o el rigor”, El Urogallo, 73 (junio 1992), p. 45. 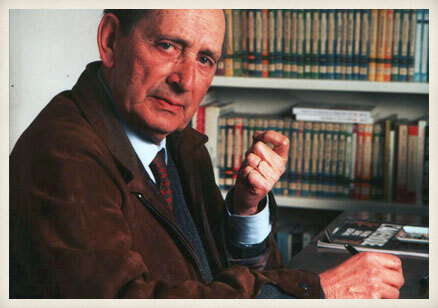 I am urgently required to write “something” about Miguel Delibes, to celebrate his latest Cervantes award. It is hard to find the exact and precise words when someone receives such an important distinction, but even harder when the person who receives the award is so deserving […]. 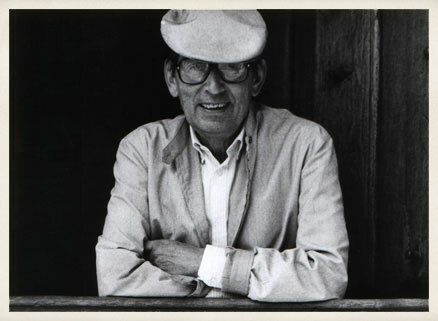 Miguel Delibes´ literary honesty goes hand in had with the endearing personality that all those people who had the opportunity to have contact with the writer get to know. His discretion, his sincere modesty his hard working ways and his greatness as a human being have to be doubtless reflected in his narrative work and so it is proven in remarkable work. Throughout Delibes´ words language adquires a new dimension in his impeccable use of the castellano from his hometown, Valladolid, used with a peculiar spontaneity, and his special elegance and care so characteristic from his writings. I think Mr. Antonio Machado wrote the biggest compliment that someone could pay to this incredibly honest, sensitive and calm man, and I do think that beyond any futile praising he is “in the best meaning a good man”. 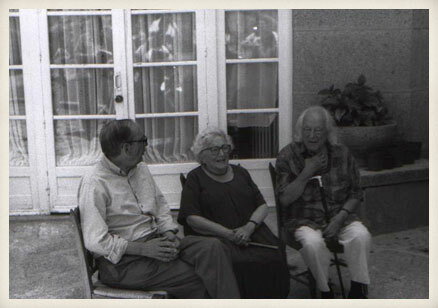 Miguel Delibes, Rosa Chacel and Rafael Alberti. San Lorenzo de El Escorial (Madrid), 1991. Rafael Alberti: “Tras el Cervantes”, en El autor y su obra: Miguel Delibes. Actas de El Escorial. Madrid, Universidad Complutense, 1993, p. 193. Hereby I confess that I dindn´t have Delibes as a role model at least consciously, when I wrote some of my essays that talk only about women or that can be considered as a monologue, and where I intended to represent the popular language of Mallorca, but somehow now I think that Delibes´ model was behind all these writings of mine. I´m afraid that the involuntary due I adquired with Delibes will be hard to pay back, but at least I expect to give him back some credit by acknowledging his influence and thanking him in public in front of you all. Also in public, before concluding, I would like to thank Miguel Delibes for some other matters that go beyond the mere stylist aspects of his literary works and that deal with the moral values that in these works defend. In a damaged and gradually less innocent world, Delibes takes care of the nature which he loves, for this reason he is a commited ecologist; he worries about the children. His childish characters are thus unforgeteable: characters like Nini in “The Rats” or Daniel el Mochuelo will walk with us foreve. In a degraded world that eagerly seeks power, and the need of being in the spotlight (including many writers), Miguel Delibes keeps on being a ankor a safe place where we can look for shelter knowing that his style and his personality will never let us down. Carme Riera: “Miguel Delibes, punto de referencia”, en Cruzando fronteras. Miguel Delibes entre lo local y lo universal. Valladolid, Cátedra Miguel Delibes, 2010, pp. 225 y 227-228. We abandoned the habit of reading Delibes because were were in a hurry to become anglosaxon writers, but we couldn´t see that he wasa very close in his attitude to an English or American novelist. 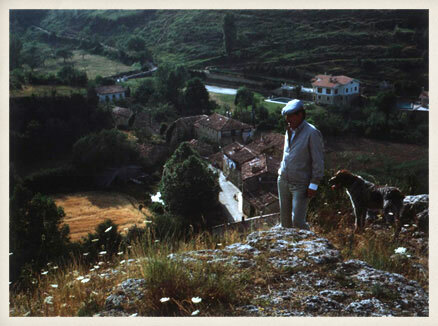 Miguel Delibes lived in his retirement writing and having long walks in the nature. He was a writer because he wrote books and not because he played the public persona or writer according to the Spanish, French or Latinamerican style [… ] Maybe if Delibes had been more likely to fall into arrogance, we would have paid more attention to him. But he didn´t even had a legend […]. He lived in Valladolid working as a civil servant and being a father of seven. Old age and illness turned him discreetly into an invisible man. Antonio Muñoz Molina: “Delibes, a lo lejos”, El País, 20. 03. 2010.